It’s winter, it’s cold and soup is warm comfort. It’s also Healthy Food Month at THE NIBBLE; so combining both concepts, we’ve got healthy soup recipes for you. Starting with 10 tips for “enlightened soupmaking,” you’ll see that you don’t need to sacrifice flavor to make family favorites and dinner party soups. 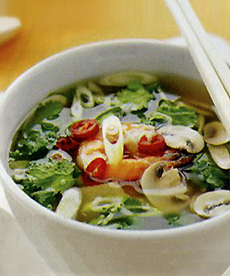 The Hot & Sour Soup in the photo is incredibly flavorful, is much more exciting than restaurant versions, and has only 143 calories per serving. It takes a mere half-hour to prepare. So, get out the stock pot and start cooking! Find more soup recipes in our Gourmet Soup Section. Check out our favorite garnishes for almost every type of soup.